A few months back we started our quest for the best banana bread. In large part it was due to this recipe. Several years ago when we lived in Minnesota, a good friend brought over her banana bread. At the time it had been years since I had actually had any banana bread. I knew I liked banana bread, but since making it with my dad I had never really been wowed by it. That is until I took a bite of Doree’s banana bread. I was hooked – we were all hooked. I kept telling Doree that she should sell this stuff to the local coffee shops. It is that good. Throughout our years in Minnesota Doree kept us supplied with this wonderful treat (It came in particularly handy when I was pregnant with Miss A!). After several months away from Minnesota and in our new hometown, I began craving this bread. I was so honored when Doree shared this recipe with us and so excited when it turned out just as good as her’s. 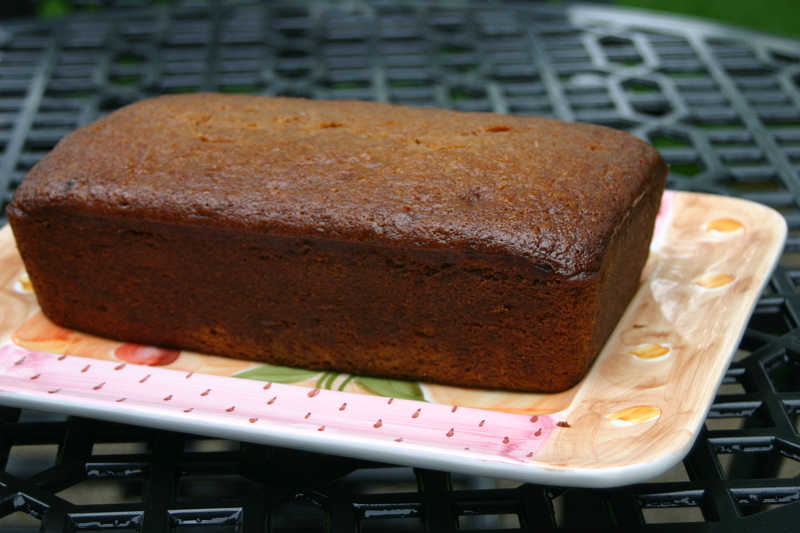 Doree’s banana bread is loaded with bananas, four or five to be exact. 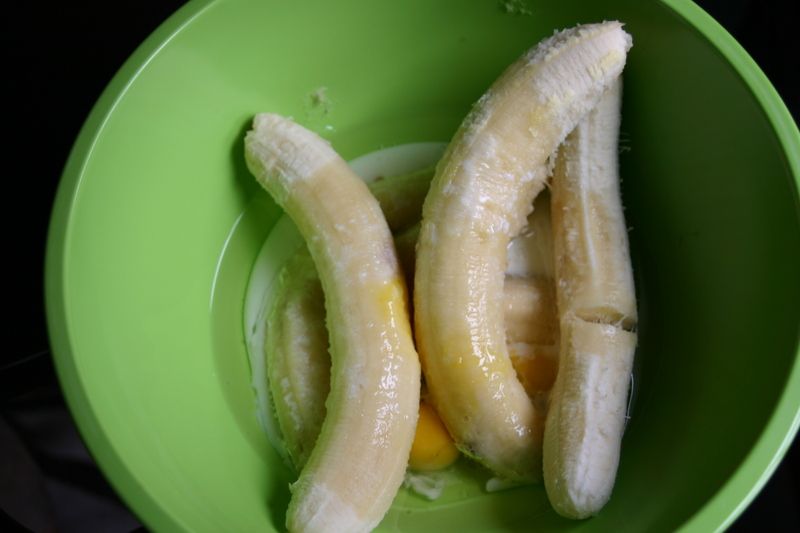 We combined the bananas with the other wet ingredients in a large mixing bowl and beat them together. The wet ingredients include eggs, vegetable oil, buttermilk and vanilla. 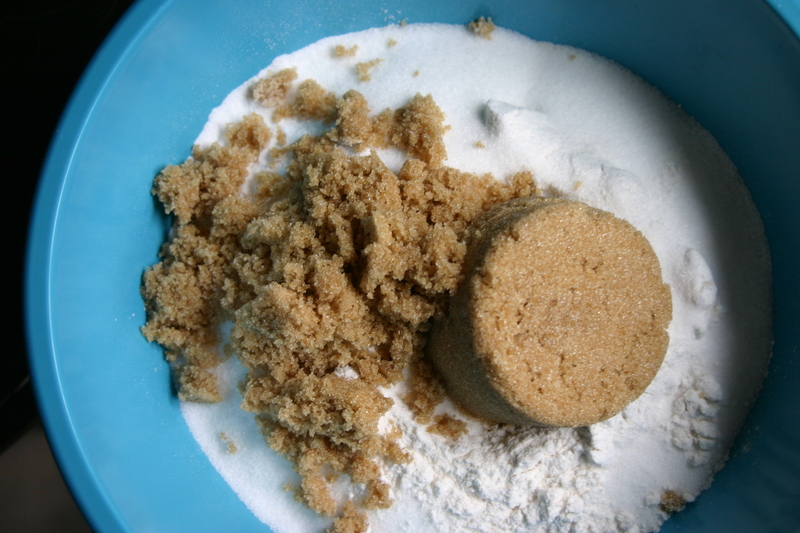 Next we sifted together the dry ingredients in a smaller mixing bowl which included white sugar, brown sugar, flour, salt and baking soda. We slowly added the dry ingredients to the wet while beating to form a smooth batter. Finally we poured the batter into the greased baking dish. Doree’s banana bread bakes for an hour to an hour and a half at 325F. The result is a beautifully browned, yet extraordinarily moist banana bread. One taste and all of us rang in with four spoons. This bread is so hard to resist – especially warm and just out of the oven. It also freezes quite well and is very tasty just slightly thawed. Regardless of how you eat it, it’s a darn good banana bread recipe. We’re still open to new recipes, so feel free to send them our way. Many thanks to Doree for this family favorite! banana bread is one of my many vices! i’m always on the lookout for good recipes! Sounds amazing… I have tried a few recipes of banana bread over the past few months and have never really, really liked the end result of most of them…I will have to give this a try…sounds yummy! Thanks Isabelle! 🙂 Have a good night! This loaf looks perfect for breakfast and afternoon snack. With a cup of coffee will be perfect! You should wrap these up and give them as gifts – the loaf look SOOOOOOOOOO good! That’s what our friend Doree would do. She’d actually make these into mini loaves sometimes and give them as gifts. 🙂 Have a great weekend Mary! Can you believe I’ve never had banana bread? When I had the chance to try it once, I wouldn’t because I was a teenager.. enough said LOL. But I really love this recipe and can’t wait to make it. And I couldn’t help but notice the little helpers weren’t in this article.. Hope the family is doing wonderfully :). I get that. I can’t tell you the number of things I wouldn’t eat when I was a teenager. LOL. 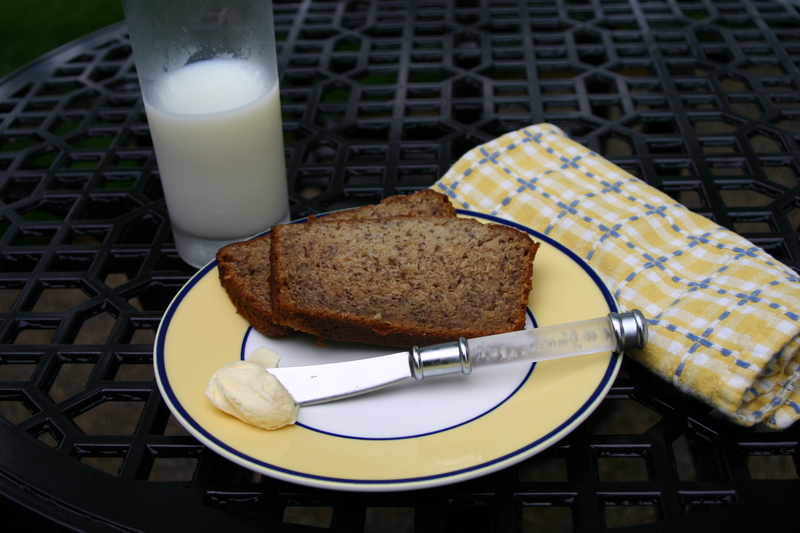 This is a great recipe and a good one to start with if you’ve never had banana bread. The kiddos were outside playing when I made this one. 🙂 But believe me, they were on hand to eat this one. LOL! Have a great weekend! This banana bread has exactly the color I go for in a good banana bread. I like that you add buttermilk – this is bookmarked! Thanks! I love this color banana bread too. The secret, I think, is to bake it at a low temperature like this for a long time. It’s so moist too! Yours just may be the best. It looks fabulous! I have two one my site. One traditional (with chocolate chips) and one bad boy of a banana bread (double chocolate!). Thanks for sharing! 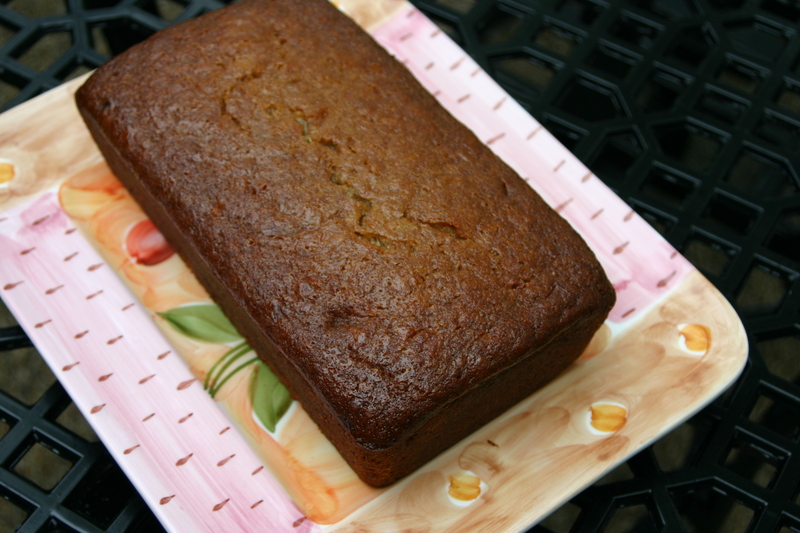 I have what I think is a pretty darn good recipe for banana bread but yours looks even better! I can’t wait to try it out! I can’t say enough good things about it. The moistness of the bread is the killer for me. What a fun exercise. This one looks so moist. I don’t like bananas, but I love the smell of banana bread and will eat it, gladly. It has been fun – and believe me the kids aren’t complaining! 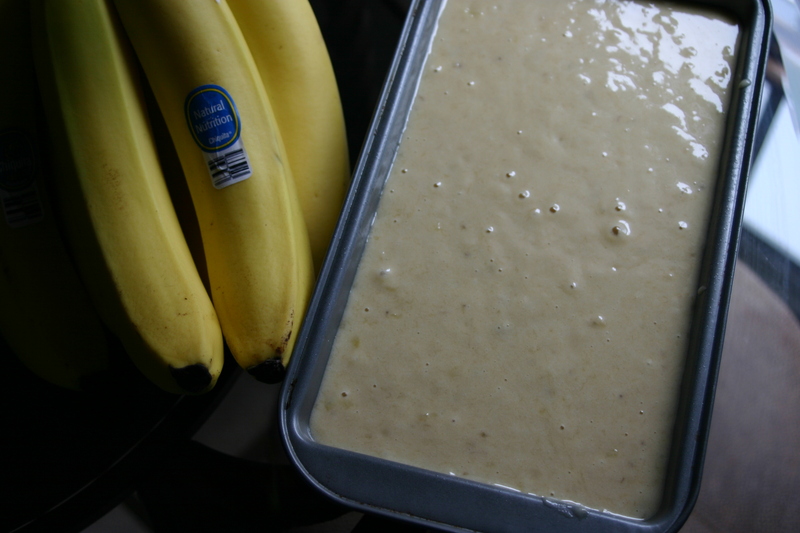 The smell of banana bread is great – I love the way it fills up the whole house. I haven’t made banana bread in a long time! Love the story behind the bread; your friend was very generous in baking for you and providing the recipe! The ingredients are very pure and simple. This weekend I have a full house of guests who I believe will love waking up to this!! That’s look yummy, love it. I never tried the banana bread before, but once I fall in love with yours, surly it deserves the try. THANK YOU, and special thanks for doree. It really is a good recipe for banana bread. I have to say it also makes me feel a little bit like I’m back at “home” when I eat it too. 🙂 Thanks for visiting and commenting! That’s how I feel for about four weeks when we span Mr. N’s birthday, our anniversary and Miss A’s birthday. Too many treats – but oh so good! Mmmmm….cheese and cakes. Mike is convinced this is the winner, but we’ve got a few more recipes to test out. And really no one is complaining about testing them. LOL. I love zuchhini bread too! I’ve never made it before, but it’s another one of my favorites. This looks amazingly good…how can it not be with all those bananas! I agree with Lisa…why do I check out yummy recipes so early in the morning! LOL! I know. It’s too bad we can’t soak up all the deliciousness on the web through the computer screen. 😉 It’s morning here and your steak salad still has me salivating. Somehow my parfait just isn’t cutting it. Ha! I usually don’t stray from my banana bread recipe, but I might have to try this one out. This is making me hungry! If it weren’t almost 11 pm, I would probably make it tonight! Hi Laura! Your banana bread recipe is coming up! 🙂 We’re looking forward to it. I LOVE banana bread! Your banana nut bread quest motivated me to bake some, but I made them gluten free for my one year old (now the dr. wants him off GF diet to be retested in the fall). I’ll have to share my recipe but it can’t beat this one. Wow, 5 to 6 banana’s! I am so hungry thinking about it! Why do I go on the computer early morning and late night to look at food recipes????? I feel the same way. I get so hungry reading all of these blogs. I would love for you to share your recipe. The kids are loving this quest – so are their friends who benefit from the samples when they come over. LOL. Gotta push as much of this off (I mean share as much of this) with others as I can. This stuff could easily ruin me. LOL!